Open Science and Science 2.0 get more and more attention in the scientific dialogue but the difference between both concepts is often unclear. The latest confusion started through the use of the two terms on the European level. The European Commission conducted a public consultation on “Science 2.0 – Science in Transition” between July and September 2014 to better understand the potential impact of Science 2.0 and the desirability of policy action. At the ERA Conference in June 2015 the results of the public consultation were labeled “Open Science” (not Science 2.0) by the European Commission. The main reason was that Science 2.0 is a registered trademark. Thus the European Commission asked for alternative terms in the public consultation. A second reason was that in commerce the concept of “Industry 4.0” is in the focus. Although it has a totally different meaning (referring to the fourth industrial revolution) the situation might be misinterpreted as science lagging behind industry. Finally, the term “Open Science” was selected among six options by 43% of respondents in the public consultation and used thereafter by the European Commission. Both concepts are closely related but there are important differences. 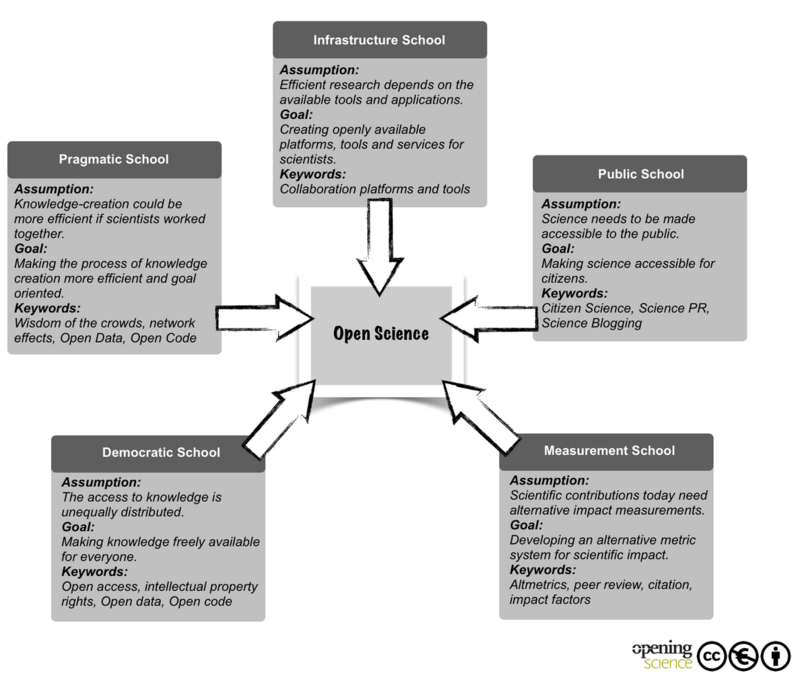 While Open Science seems to involve a normative requirement for opening up science (with main aspects such as open access to research data and publications), Science 2.0 is about the use of the participatory web 2.0 for science (Fecher/Friesike provide an overview of the leading discourses by suggesting different schools of thought for Open Science). In our notion, Open Science does not need to be Science 2.0, in a sense that it does not necessarily use participatory web technologies; and Science 2.0 – on the other hand – does not automatically need to be open. For example, a paper can be written by a single researcher without any interaction in the Web 2.0 (thus no Science 2.0) but being published in an open access journal (thus showing elements of Open Science); or a paper can be generated in a collaborative web-based setting (thus in a Science 2.0-like environment), but can be published in a licensed peer-reviewed journal (thus being neither open access nor Open Science). At the same time there is no doubt that both concepts benefit immensely from each other. Science 2.0 can support Open Science, for instance, if an open access publication is disseminated and shared via the participatory web, e. g. via Twitter or discussed and recommended in a scientific wiki or blog. The more open the science system is the easier collaborative working will be and the more open access content (e.g. data, publications etc.) is available, the more knowledge can be disseminated through Social Media and discussed in blogs and wikis. In this respect, the European Commission highlighted the “considerable societal and economic impact” (background document to the public consultation “Science 2.0: Science in Transition”). Whether the label is “Science 2.0” or “Open Science”, it is mandatory to keep both concepts and their interdependencies on the agenda; otherwise huge potentials for the scientific community might be overlooked. With the European Commission promoting Open Science there comes along the danger of focusing predominantly on open access to publications and research data. These are undoubtedly extremely important issues, but not the only ones. For instance, research based on sensitive data (e.g. personal data and others) will have difficulties to follow the path of Open Science immediately, but might benefit from a Science 2.0-surrounding. In addition, new publication forms in the participatory web like wikis and blogs might not get enough attention if the focus in the debate is too much on Open Science only. From a systemic view Friesike/Fecher argue that there is “…a necessity for holistic approaches in research on the future of research. For example: How could one argue for extensive practicing of Open Data if there is no remuneration for those who do it? How could one expect a researcher to work collaboratively online if platforms are too complicated to use? Why should a researcher invest time and effort in writing a blog if it has no impact on his or her reputation?”. To further investigate some of these issues the European Commission initiated a High Level Expert Group on the European Open Science Cloud initiative. The group will advise the Commission concerning the policy strategy for a European Open Science Cloud initiative, how to develop it, what services it should offer, what form it might take (e.g. PPP), and what governance would be appropriate. Science 2.0 and Open Science cannot be dealt with independently but it is important that both sides of the coin gain attention and a holistic approach is pursued. The transdisciplinary Leibniz Research Alliance Science 2.0 follows three pillars of research (new working habits, technological development and user behaviour research). It pursues an integrated approach with respect to topics such as open access, virtual research environments or digital humanities, thereby further exploring the interdependencies and overlaps between Science 2.0 and Open Science. The alliance’s research is about the future of research – in a transdisciplinary manner. Therefore the Leibniz Research Alliance Science 2.0 currently consists of 37 partners from different disciplines. 24 partners are full members, thereof 19 Leibniz research institutes and infrastructures, 13 are associated research partners, mostly universities (it consists in equal parts of research and information infrastructure facilities). The Leibniz Research Alliance Science 2.0 is currently the only organized research alliance on this topic in Europe. The main objective of the alliance’s current and future activities is to establish Science 2.0 as truly novel and transdisciplinary research field in the scientific community. The measures taken by the alliance are designed to enable German policy makers and research funding agencies to take a leading role in the European debate on how to further develop Science 2.0/Open Science in the (digital) European Research Area (ERA) of Innovation to maximize the benefit from Europe’s investment in science. To keep pace with the changing trends on the European level and the overall transformations in the scientific system we identified three important measures. Some federal states of Germany have open access strategies but these need to be brought together to define a national open access strategy.